Science is everywhere. Science is everything. Welcome to my online portfolio. Hello! Selected works are to the right. More about me is below. WILL GRASSLAND SOIL WEATHER A CHANGE? 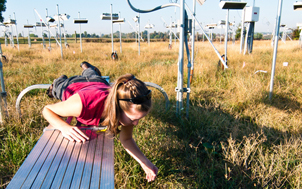 Elizabeth Carlisle reaches into a +Heat plot during plot work in Fall 2010. Photo credit Danny Walls. There’s more to an ecosystem than the visible plants and animals. The soil underneath is alive with vital microbes. They make sure nutrients from dead plant and animal material are broken down and made useable by other plants. This completes the process of nutrient cycling and carbon storage. Scientists are learning more about how important these microbes are. But how do changes in temperature and precipitation levels affect microbes? And will that affect carbon storage?